Holiday City at Monroe is an active adult community located in Williamstown in southern New Jersey. The community is made up of 682 single-family homes built by K. Hovnanian. Residents of this socially active community enjoy amenities geared towards their tastes. A well-appointed clubhouse provides space for gatherings as well as recreational opportunities like swimming and tennis. Homebuyers will see why residents love living at Holiday City at Monroe in Gloucester County, NJ. Most of the community's amenities are located in the well-equipped clubhouse at the southeast corner of the neighborhood. Inside, residents have access to multi-purpose rooms where social events are held. Outdoors, a pool and patio are natural gathering places on warm summer days. Those looking for active recreation opportunities will appreciate the two shuffleboard courts and two tennis courts. The community is entirely linked by paved sidewalks, making it easy to enjoy this serene, wooded 55+ neighborhood. Holiday City at Monroe is comprised of 682 single-family homes built between 1989 and 2007. Given this lengthy period of construction, a wide variety of floor plans are available, starting at approximately 1,300 square feet. Most homes have at least two bedrooms, two bathrooms, and attached one or two-car garages. The majority of plans are ranch-style homes. Those with two floors typically have master-suites located on the first floor. Front and back porches are common and allow residents to enjoy the scenic, wooded surroundings. 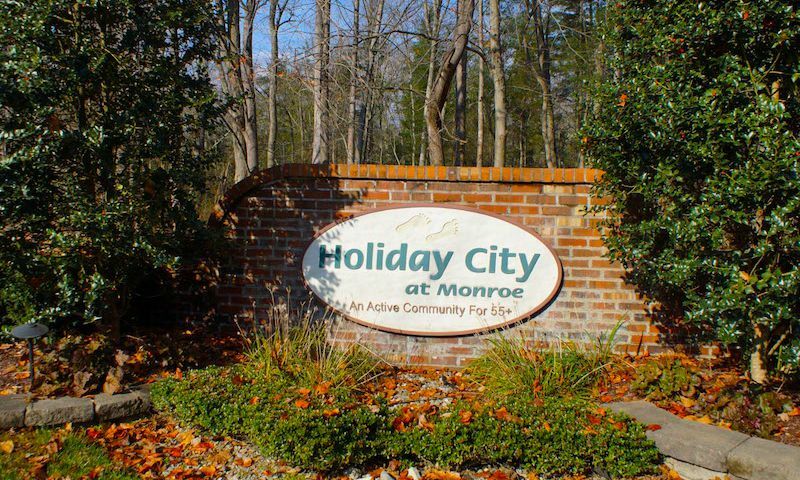 Homeowners in Holiday City at Monroe can expect a fun-filled, socially centered lifestyle. At the clubhouse, neighbors will be able to regularly gather for community get-togethers and parties. On warm summer days, residents enjoy swimming or lounging by the outdoor pool. Residents can also challenge each other on the shuffleboard or tennis courts. The modest monthly homeowners' association fee also provides a low-maintenance lifestyle with snow removal and maintenance of clubhouse amenities taken care of by professionals. Holiday City at Monroe is located in Williamstown, New Jersey. Golfers will love that the community is within five miles of the locally popular Scotland Run Golf Club, offering 18 holes of beautiful golf. Holiday City at Monroe is also conveniently located just minutes from a variety of stores on North Black Horse Pike, giving homeowners proximity to a Home Depot, Sam's Club, Walmart Supercenter, Target, and restaurants. Traveling to Philadelphia or Wilmington is easy with the Atlantic City Expressway just under an hour away. Gloucester County is also home to several attractions including the Gloucester County Historic Society Museum, Washington Lake Park Amphitheater, the Gloucester - Williamstown Biking and Hiking Trail, and the Gloucester/Salem Wine Trail. Holiday City at Monroe has the desirable homes, amenities, and location to make it a fantastic 55+ community in Southern New Jersey. There are plenty of activities available in Holiday City at Monroe. Here is a sample of some of the clubs, activities and classes offered here. Holiday City at Munroe is comprised of 682 single-family homes built between 1989 and 2007. Given this lengthy period of construction, a wide variety of floorplans are available starting at approximately 1,300 square feet. Most homes have at least two bedrooms, two bathrooms, and attached one or two-car garages. The majority of plans are ranch-style homes. Those with two floors typically have master-suites located on the first floor. Front and back porches are common and allow residents to enjoy the scenic, wooded surroundings. 55places.com is not affiliated with the developer(s) or homeowners association of Holiday City at Monroe. The information you submit is distributed to a 55places.com Partner Agent, who is a licensed real estate agent. The information regarding Holiday City at Monroe has not been verified or approved by the developer or homeowners association. Please verify all information prior to purchasing. 55places.com is not responsible for any errors regarding the information displayed on this website.